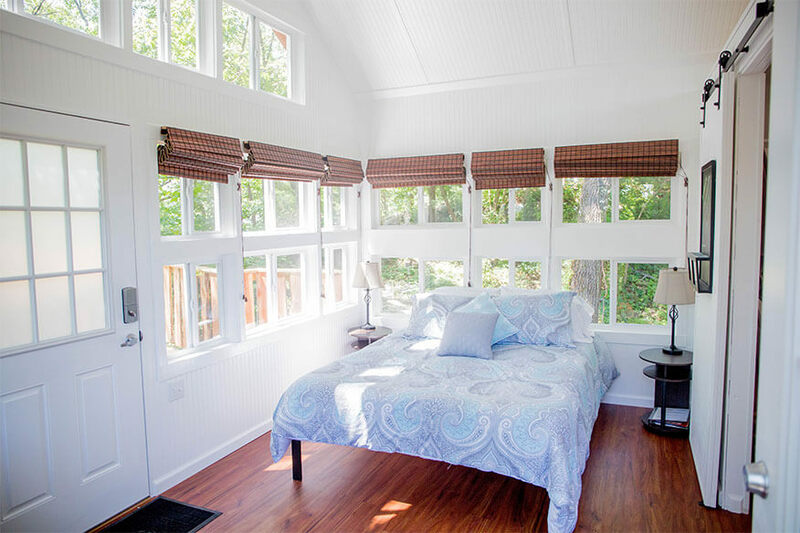 The Cottage is a 5 acre tree house bed and breakfast property only 4 minutes from downtown. 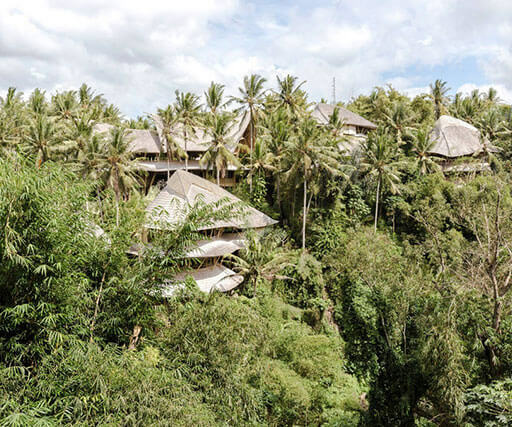 We invite you to come relax and reconnect in one of our three custom-designed tree houses. Each one features a queen-size bed, decks to enjoy the surrounding environment, and many amenities you have at home like heating/cooling, mini-fridge, microwave, and Keurig coffee maker. All our tree houses are equipped with hot and cold running water, sink, shower, and toilet. This was our first tree house to be completed. t’s name is derived from the fact that after working a full-day to get the tree house ready, we sat down on the custom window bench and were greeted by a beautiful sunset coming through the window. It was at that point, we knew we had the perfect name chosen. The main floor houses the bathroom, dining area, and living room, plus a front and back deck with adirondack chairs. The sleeping loft is a cozy space with a queen size bed surrounded by 14 windows. You’ll have no doubt that you are sleeping in the trees. The Sunrise was our second treehouse to complete. 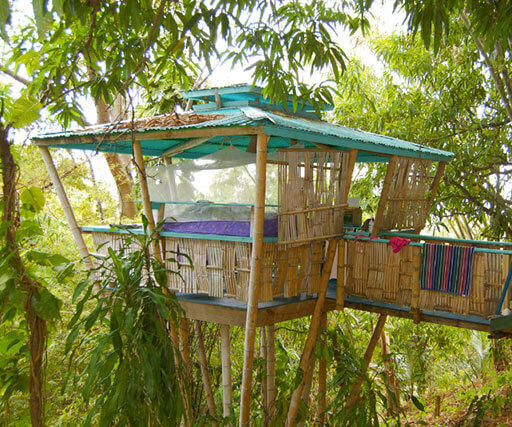 It is our tallest treehouse and sits safely a few feet back from the edge of a small cliff. It has a larger sleeping loft than its sister the Sunset, and a main level dining area, living area with a built-in chaise couch, and bathroom. Outside you can enjoy the 3-quarter wrap around deck to sit with your coffee to watch the birds, squirrels and local wildlife run around. If you’re an early riser, you’ll get a great view of the sunrise in the morning. 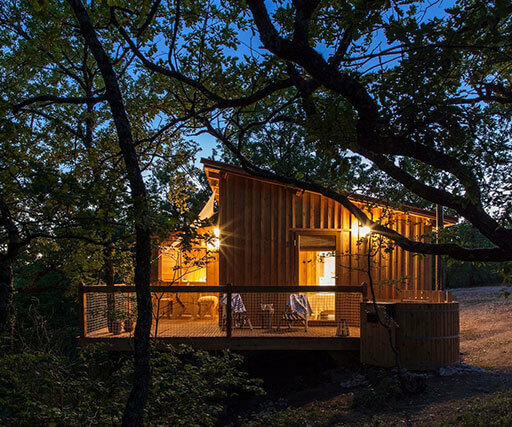 All of our tree houses are perfect to sit back, relax and enjoy a slower pace of life. The Moonlight, named by our 6-year old son at the time, holds a special place in our heart. 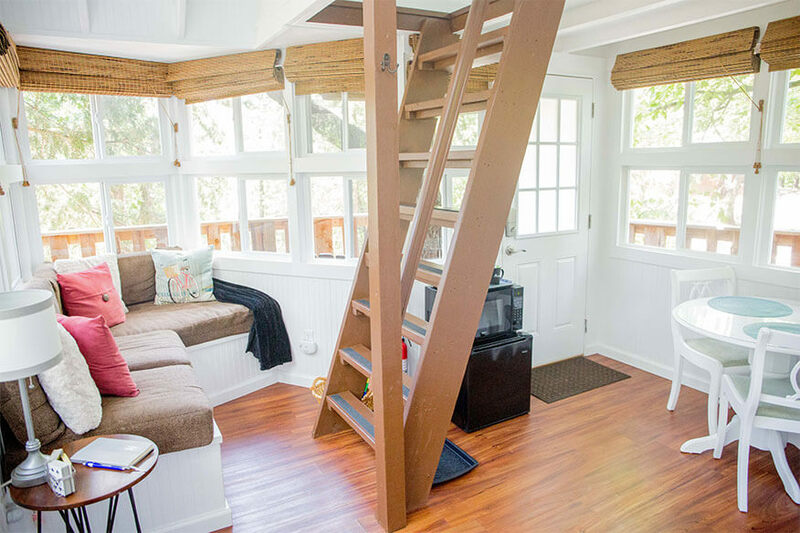 This tree house is wheelchair and mobility friendly. We desperately wanted to make our property accessible to all people. 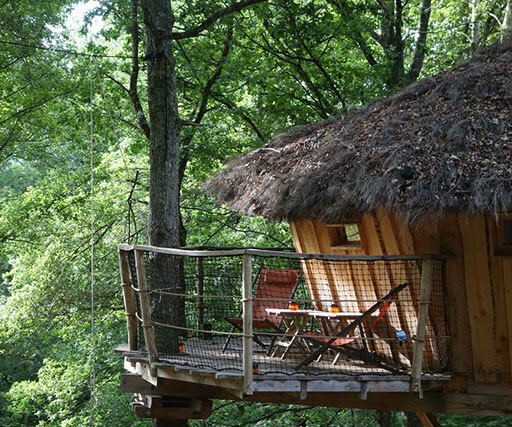 Those with mobility issues such as bad knees/back/hips, or being confined to a wheelchair may not have been able to partake in staying in a tree house. Our Moonlight helps them experience this with ease. You access this treehouse ground level through a footbridge that leads out to the structure and a 30 foot drop on the other side so you can enjoy sleeping up in the trees. 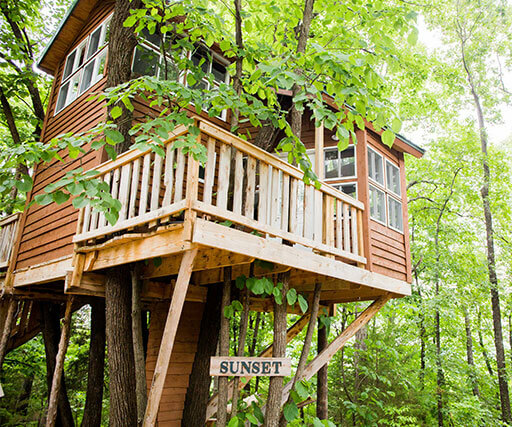 It has everything our other treehouses offer with no stairs and no ladder. Each morning, you can stroll down to our main building and be served a full hot breakfast complete with a smoothie, a sweet, and a savory egg dish. We’ll grab you some coffee and you can enjoy our indoor or outdoor seating. We also have a secondary building on the property called the Studio. It provides a little extra space to play games, a leather couch and chair to curl up in front of the fireplace with a good book, and a zero-gravity massage chair to help you relax. So whether it’s summer, fall, winter, or spring, The Cottage treehouses are a unique and memorable place to stay while you enjoy Hermann.